KOFU, YAMANASHI PREF. - In light of increased volcanic activity at some popular tourist spots across the country, a new evacuation map has been released to aid climbers and tourists in the event that Mount Fuji erupts. The climbing season for the country’s highest mountain begins next month and runs through mid-September. Local authorities have posted an evacuation route map online that outlines four scenarios for how the mountain might blow. They also held a disaster drill Thursday for local tourism businesses and the emergency services. The peak, which straddles Yamanashi and Shizuoka prefectures, draws roughly 300,000 climbers a year and is designated as an active volcano. However, it is difficult to predict how it might erupt as the 3,776-meter peak has a number of possible vents. 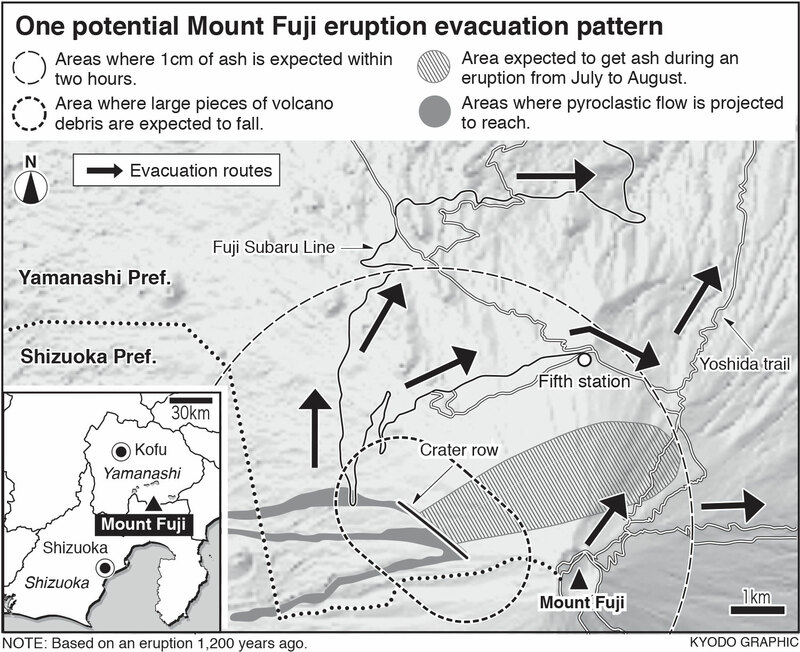 Yamanashi Prefecture’s official disaster map shows evacuation routes for four possible eruption patterns based on the vent’s location and the reach of lava. The models are based on known eruptions that took place 1,000 years ago and earlier. 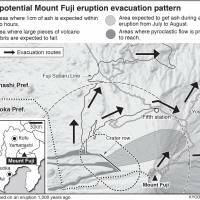 The Yamanashi Prefectural Government previously issued a hazard map for residents living at the foot of Mount Fuji. It drew up the latest map for visitors in the wake of the disaster atop Mount Ontake, in which an unexpected eruption last September left 63 hikers dead or missing. Six of the bodies have not been found. 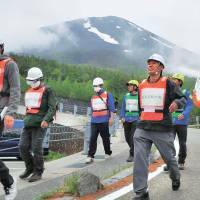 At a large parking lot halfway up Mount Fuji on the Yamanashi side, about 150 shopkeepers, lodge managers, police officers, firefighters and officials took part in the first disaster drill. “The eruption of Mount Ontake is not someone else’s problem. 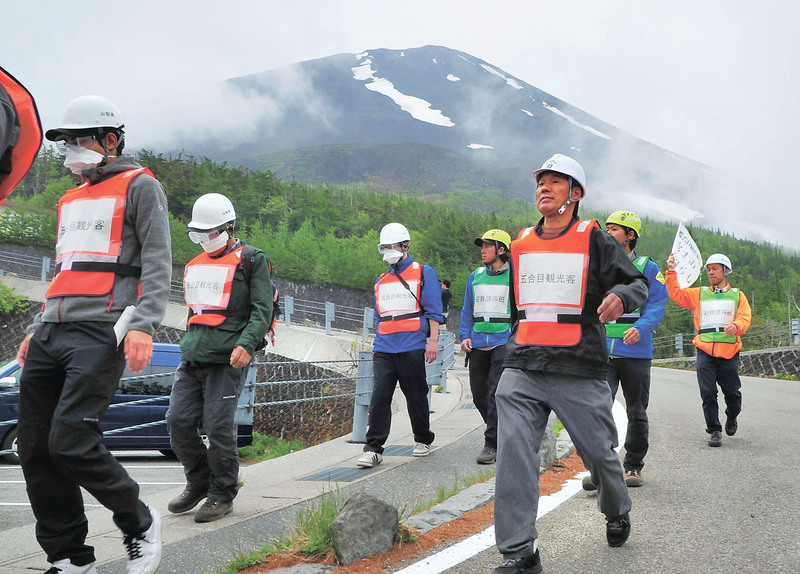 We hope to make a mountain people can come to with an easy mind by continuing this kind of drill,” said Noriyuki Osano, head of the local disaster network. Mount Ontake was not the only popular tourist site affected by recent volcanic activity. The hot spring area at Mount Hakone about 80 km southeast of central Tokyo saw its ground level rise by up to 15 cm in two weeks last month amid increased volcanic activity.